The teacher’s voice echoed in my ears as I crouched on the dirt track. “Ready, set, GO!” I sprung forward and quickly reached my maximum speed, my long hair trailing back from my face in the breeze. My eyes were glued on the first hurdle while I concentrated on spacing my strides so my right leg would clear the bar as I jumped. Made the first one. Eyes on the second hurdle. Pace, pace, pace, jump. Now the third. Pace, pace, pace, jump. 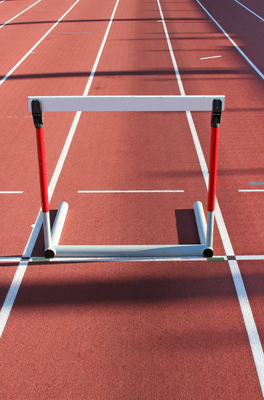 Back in eighth grade, I enjoyed learning how to jump hurdles for the track team try-outs, even though I didn’t run fast enough to make that event. (I competed in the triple-jump, but missed my starting mark each time because Eddie, the boy I had a crush on, was the spotter). Now, as I sat on my sofa reading Psalm 81, the vision of those hurdles came back to me. That’s how I’ve been living my life, racing with my eyes glued on one hurdle after another. I no sooner got one problem solved, or one project finished, then I was off to the next. But in Psalm 81, God tells us to stop and sing for joy as we remember how God has helped us and brought us through. After God delivered Moses and the Israelites from Egypt and brought them through the sea on dry land, they broke out in song, praising God (Exodus 15:1-18). That’s what Psalm 81 is talking about. I thought back to the day before, when I was stressed and worried about a meeting that night. God answered my cries to him and not only calmed my heart, but worked in everyone’s heart to bring about a smooth meeting. Afterward, I said a simple “Thank you” to God, and then moved on to the next hurdle. If I want more joy in my life—the joy God wants me to have—I need to stop and celebrate when God does good things. I need to stop and praise God. I need to stop and feel the joy, live the joy, practice the joy that God provides. I need to stop and take time to drink deeply and savor God’s victories, big and small. This is God’s plan for us. Psalm 81 says so. I fell in love with this from the title before I even read the blog. I love all you’ve shared over the past few posts. The comment about Eddie made me smile….I could just see it playing out. Thanks for the reminder, Kris. Yes, my son ran track in high school and this post illustration is a perfect metaphor for life. As a spectator Mom, I imagine you felt your son’s concentration on the hurdles as he strove to pace his steps just right to make each jump. Thanks for sharing. You are such a great encourager, Susan. I’m glad you liked my post. You made such an excellent choice using Kool & The Gang’s “Celebration”! We had a great time listening to it and relating it to our relationship with God. I hope you continue to post your creative and inspiring insights to this blog site well into the future! Yes, if I would spend as much time celebrating God’s victories as I do working on the problems, how much brighter my world would be! Thanks, Bethany, for your supportive comments and sharing.